China's first ALWEG-type monorail system officially opened on June 18, 2005 in Chongqing, China. The monorail serves the main business and public districts. Line 1 begins as a subway under downtown Chongqing, then runs west elevated along the southern bank of the Jialing River, then turns south into the city's southwestern suburbs, ending in the Dadukou district. Construction began in January of 2001, and the intitial line included 2.2-km of subway tunnel with three subway stations. The Japanese Bank for International Cooperation (JBIC) provided a loan to finance the development of the monorail. 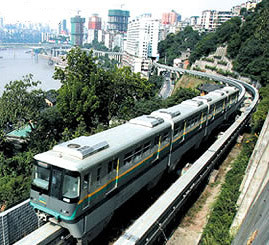 The Chongqing Monorail is capable of carrying 30,000 passengers per hour at peak hours. In September of 2011 Line 3 opened, adding over 17 kilometers to the system and making it the longest monorail system in the world, surpassing the previous record holder in Osaka, Japan. Then in December of 2011, Line 3's extension to Jiangbei Airport opened. With that addition, Line 3 became the longest monorail line in the world at 39.1 kilometers. In December of 2012 Line 3 opened an extension in the Yudong district, making the line even longer at over 55 kilometers with 39 stations. Line 2 and 3 were connected in the south on December 30, 2014. Chongqing Monorail will probably be the largest monorail for a long time. 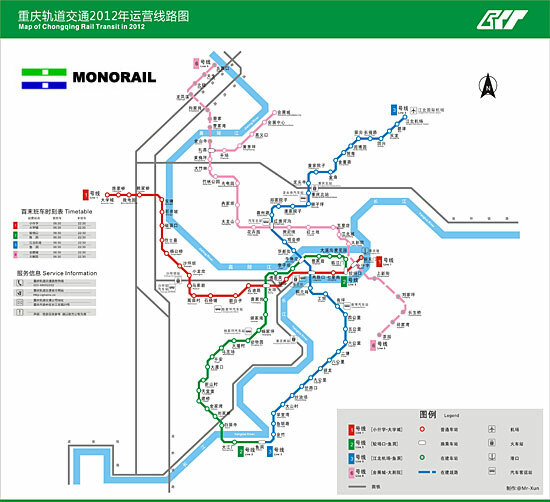 The Chongqing Monorail also is the only monorail system in the world with an X-shaped crossover point. Line 3 features the highest river crossing of any monorail system in the world, with the Jialing River crossing on the Chongqing Yu'ao Jialingjiang Bridge.